Binge drinking, prescription drug abuse and recreational drug use are all common problems on college campuses. College students make up one of the largest groups of drug abusers nationwide. Young people (ages 18 to 24) are already at a heightened risk of addiction. Those who are enrolled in a full-time college program are twice as likely to abuse drugs and alcohol than those who don’t attend college. Alcohol makes up the vast majority of substance-related problems on college campuses. Because drinking is often socially acceptable, recognizing a problem in college students who drink can be difficult. Dubbed the “study drug,” Adderall and other stimulants are increasing in popularity among college students who are facing pressure to meet all of their academic requirements. As legislation tips in favor of marijuana legalization, more college students are turning to pot as their drug of choice. On some campuses, marijuana use outweighs even that of alcohol. Popularized in the 90s, ecstasy has made a resurgence in recent years in its pure form, known as MDMA or molly. College students fall well within the target age range for the “party drug,” which is most often abused by teens and 20-somethings. MDMA is most common at raves and concerts. Alcohol is the most popular and dangerous drug on college campuses by far. To many, drinking is synonymous with the college experience; alcohol is nearly always present at house parties, sporting events and student get-togethers. 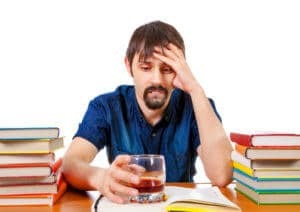 Because the use of alcohol during college is widespread and often condoned, many college students end up drinking more alcohol more frequently than their peers who aren’t in college. Four out of five college students drink alcohol. Nearly half of students who drink have reported binge drinking, according to a report by the National Institute on Alcohol Abuse and Alcoholism. Excessive drinking is not only a major health concern in the long-term, it can lead to immediate tragedies such as assault, injury, arrest and even death. Learn more about binge drinking and the effects of alcohol on college campuses. Although fraternities and sororities aim to create a family-like environment for college students to pursue academic and philanthropic endeavors, drinking and drug abuse in the Greek system is more common than students outside the system. Students who are part of the Greek system are up to 26 percent more likely to binge drink. Fraternity and sorority members are more likely than their non-Greek peers to abuse prescription drugs, including Adderall. College students as a group are considered high-risk for the development of eating disorders. In fact, up to 25 percent of all college students struggle with an eating disorder, according to a report by the National Institute of Mental Health. Alarmingly, that number is on the rise; one study showed the number of both men and women affected by an eating disorder has grown significantly over the past two decades. Many college students turn to diet pill abuse to help them lose weight. This can cause severe health problems up to and including death. Find out more about eating disorders and diet pill abuse on college campuses. If you are a college student struggling with binge drinking, prescription drug abuse or an eating disorder, you don’t have to face this difficult time alone. Our addiction specialists can get you in touch with caring, experienced counselors to help you through it. Get in touch with our treatment experts to take your life back from substance abuse or addiction.